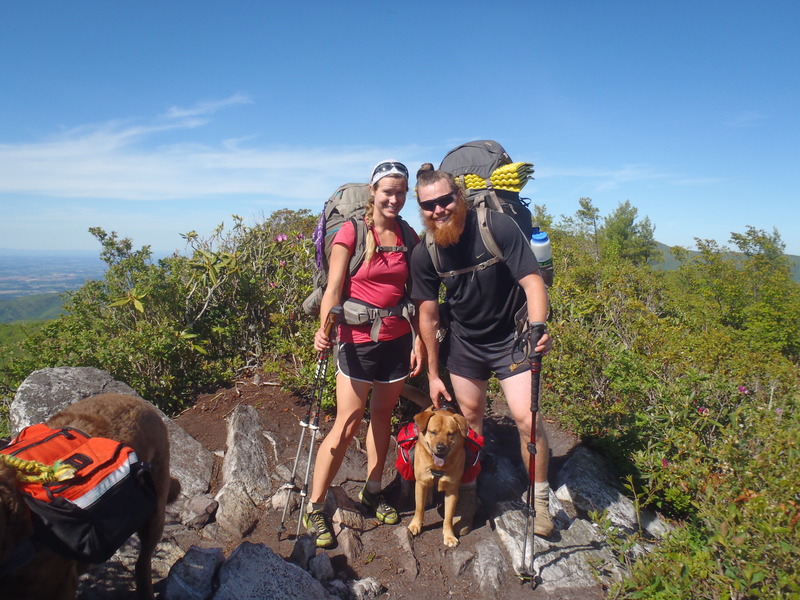 Our pup, Hunter, joined us after Lindsay healed up from her tailbone dislocation to finish off our 2014 Appalachian Trail Thru-Hike team; making us Hunter and The Fat Kids. Hunter is not your average pound dog and therefore not your average trail dog either. What they didn’t tell us when we adopted him from the pound 3+ years ago is that he is 1/3 Chow Chow, 1/3 Alaskan Husky and 1/3 Mountain Goat. He is the perfect companion for a long distance hike; athletic, agile, powerful, durable and possesses a level of endurance that Lindsay and I can’t come close to touching! 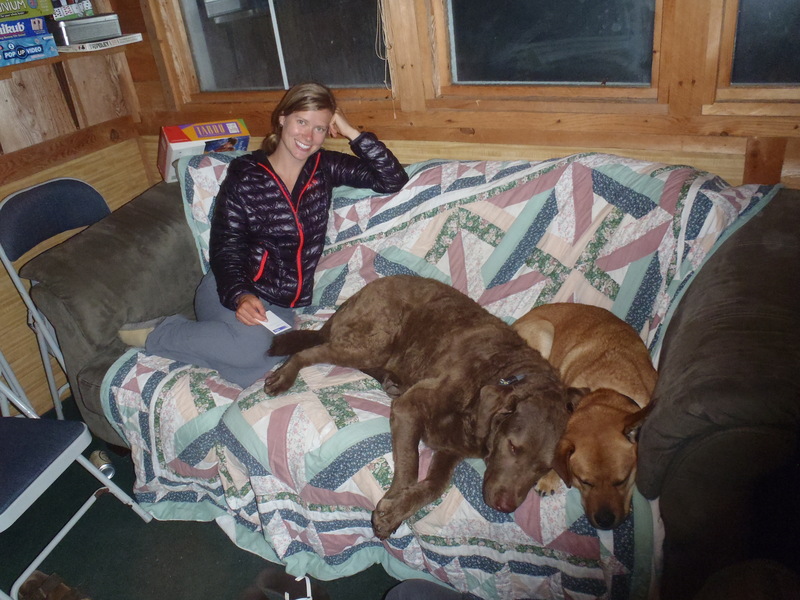 Lindsay and the puppies enjoying move night in the common area. Now that we are well into Hunter’s first 500 miles on the trail we figured we should put in an update for him, and since he doesn’t have opposable thumbs or a solid grasp of the English language it seems that I have to do the writing. He started the first hundred miles getting his “trail legs” under him before we really worked him too hard. His very nice parents were willing to carry his food and pack for the first week which allowed him to get his legs and paws acclimated to 15-20 miles of walking per day. As the days went on he started carrying his pack with no food and then we kept adding weight to him until he hit his goal pack weight of 5lbs, or 10% of his body weight. For the last two weeks he has been carrying about 4 days of food at a time and as he eats it down I (Clay) get to fill him back up with the extra food that I’m carrying. Clay, being a good parent and giving water to the trail princess. As with any hike, dialing in the gear is a necessary learning curve and we decided to replace his pack after about 200 miles of walking. His old pack still got the job done but we learned that it was a size too big (after he lost some of his Nana-induced winter weight) and that the whole harness system just ended up being too bulky and cumbersome. We could trim a pound off his pack weight by switching to a slightly better made and sleeker design, allowing him to stay cooler, better balanced and able to carry an extra two days worth of food. Lindsay, Clay and Hunter on a ridgeline in NC. We’ve also found Hunter’s two greatest nemesis on the trail, one we knew about and the other we learned the hard way. High temperatures were going to be his biggest enemy and we had to account for that with a change of walking schedule. Getting up early and resting through the heat of the day definitely works but it also has the side effect of finishing the day and getting into camp very late in the evening. We’ve found that getting on the trail by 7am and then strategically planning breakfast and lunch breaks can make sure that we don’t tackle any major climbs between noon and 3pm. Hunter seems to do alright on flats and downhills as long as the temperature on the trail is in the 80s and he gets a water break every hour or so. The other problem that mother nature has thrown his way is rocky ground. His paws are quite tough from a lot of hiking and being an active outdoor dog but doing 20 miles on sharp ground rocks for days in a row is a different animal. In the last week his paws have shown signs of cracks and wear, largely due to the terrain we have been walking over. To combat this we put a salve known as Musher’s Secret on and between his pads, providing much needed moisture and a barrier to protect the surface while it heals. It has been working so far, but the best medicine will be some time off. That time off is coming soon. Hunter is going to head back to Maine for some much needed R&R when we get to Harper’s Ferry, WV. 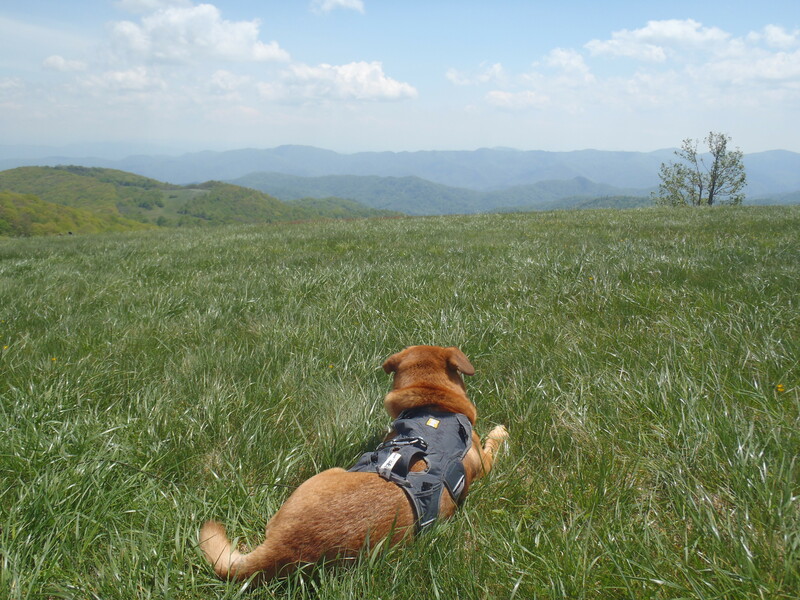 At that point he will have done 700 miles through the southern Appalachians, a feat not to be scoffed at by human or canine. He is going to take about three weeks off at his grandparent’s house as we walk through the hottest and rockiest part of the AT. This will allow him to rest some tired muscles, heal his cracked pads and put on some extra weight for round two. We hope to pick him up somewhere in Connecticut or Massachusetts, once we can get out of farm country and into the woods and some higher elevation. He should be good to go for the rest of the summer at that point and the squirrels, rabbits, raccoons, deer and anything else small and fury that lives near the trail will once again be chased off into the woods or up a tree! I am having a blast following you guys on your hike! You seem like you are very well prepared and as a dog owner I am happy with the way you are handling the dog during the hike! I live in the western mountains of Maine and know first hand how tough it is thru our state! Keep up the good work,stay safe and am looking forward to your posts when you get to the prettiest state on the trail, Maine!! Lindsay and Clay, it was great to meet you and Hunter (and chubby bunny)yesterday and hangout at Gathland State Park in Md and the creamery. Glad you loved the greek food and ice-cream! After you left, I wished we exchanged cells so I can hear about your progress to Katahdin- but I will follow this journal. Also I may be able to meet you at PenMar park depending on when you get there. Have fun with the parents, and Happy Trails. Vicki, you are awesome! 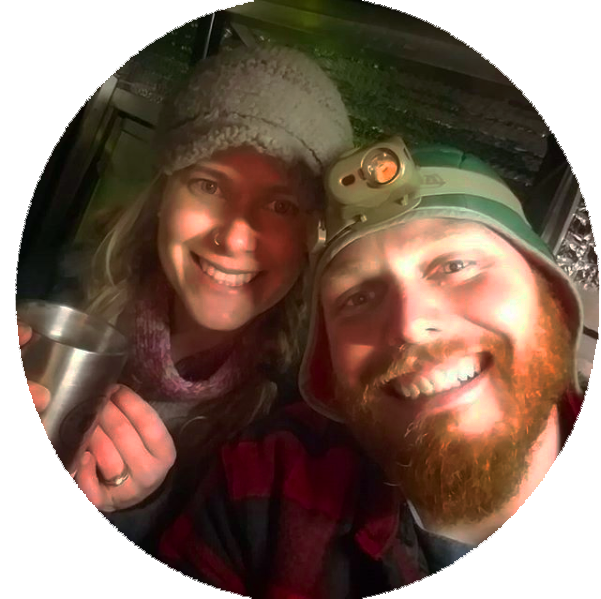 Thank you so much for the trail magic and when we drive down this fall to finish up the Smokies maybe we can drop in to give you a proper thank-you! Glad to see you’re still going strong! Wishing you and Hunter the best! Thanks so much for checking in, hopefully we’ll get a lot better at keeping everyone updated! Hi Guys. We are following your Blog Site and really enjoying it. Hey, thanks for following along! When do you guys plan on coming to the states again? We’d love to see you if it was anywhere along the east coast. Hi Lindsay & Clay no plans this year to visit the States. Maybe next year.